Crab cakes with cocktail sauce are amazing. All I've done was eliminate the grains and overly processed ingredients from any old basic crab cake and cocktail sauce recipe. You won't miss anything (although my dad said he missed the ketchup- thats probably because his cocktail sauce was no longer 50% sugar. If you're like him and need a hint, or a slap in the face, of sweet you can add a bit of honey to the sauce). These babies hold together like a gem thanks to the binding abilities of egg and the liquid absorbing properties of coconut flour. The greek yogurt just ensures that your cakes don't get dry and crumbly. Whisk together tomato paste, water, vinegar, garlic and onion powders, cinnamon, nutmeg, cloves, horseradish, 1 tsp of the worcestershire, 1 tbsp of the lemon juice, and the hot sauce. You can thin out the cocktail sauce to your desired consistency with extra lemon juice. Set aside. Mix together the egg, dijon, coconut flour, parsley, old bay, baking powder and greek yogurt. Fold in the crab meat. Form about 8 to 10 small patties. Cook the patties over medium/low heat for about 4 or 5 minutes a side or until they get golden brown and little crisp. 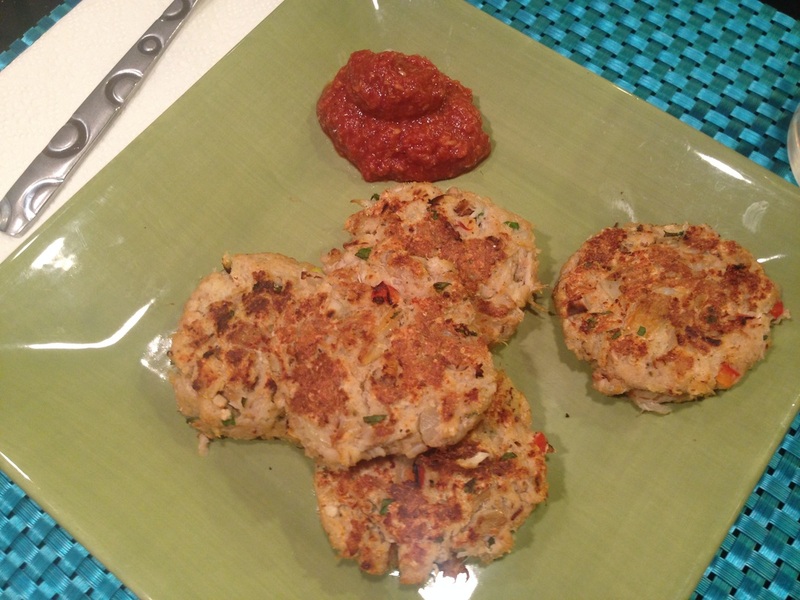 Serve crab cakes with the cocktail sauce.